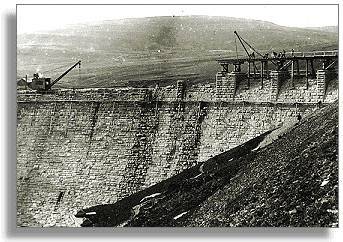 The amazing system of huge dams and lakes in the Elan Valley of mid-Wales was built between 1893 and 1904. The project was carried out by Birmingham City Council to provide a source of clean, safe water for the growing population of the city and it's manufacturing industries. The dambuilding scheme provided jobs for thousands of construction workers, and changed the local landscape for ever. and a hospital for the casualties !